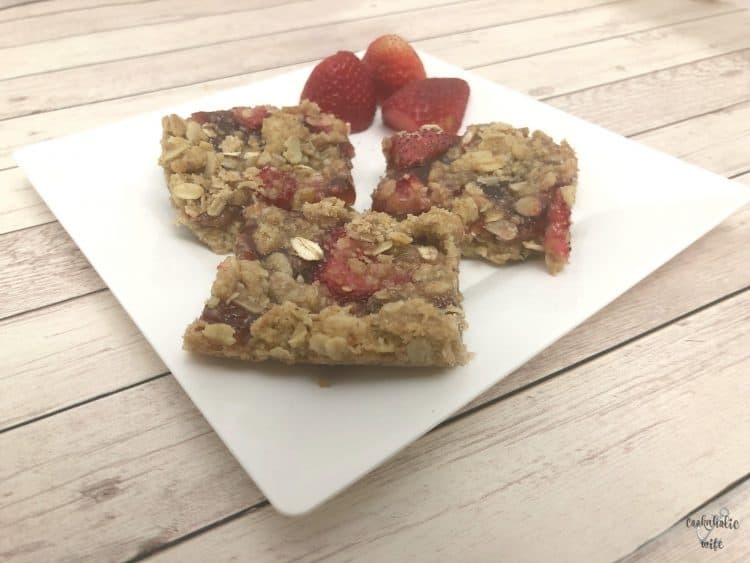 Strawberry Rhubarb Crumb Bars are made with an oatmeal crust, topped with jam, berries and rhubarb and are baked to sweetened perfection, only using 8 ingredients! Is rhubarb available in your area? I honestly haven’t been able to find it fresh for the last two years. I was hoping to get lucky this year as I picked the ingredients for April’s Improv Cooking Challenge to be strawberry and rhubarb. And yet, I still haven’t. Maybe it’s still too early? So with no rhubarb and it being a main ingredient, I had to get creative. Cooking with frozen rhubarb is nearly impossible because of the way it holds onto water once frozen. Have you ever frozen celery or bell peppers and then cooked them? They get mushy and add too much water to the recipe. 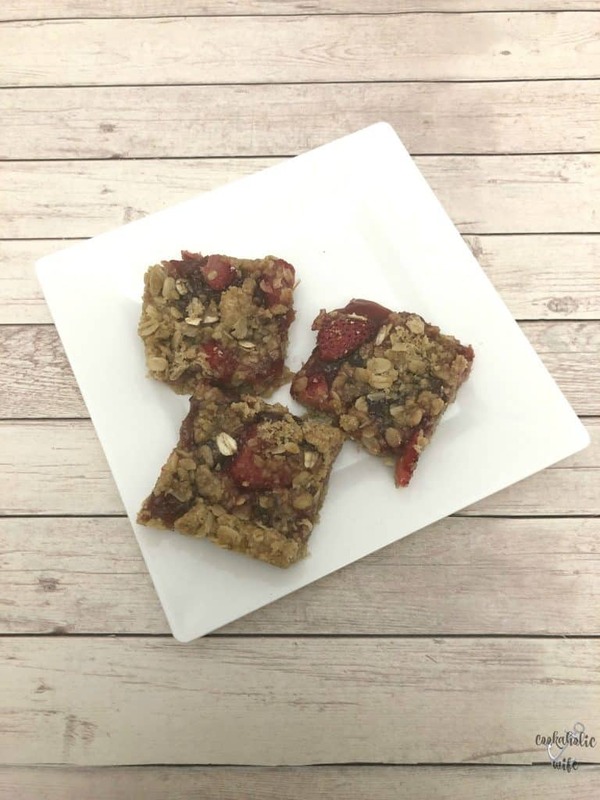 Same thing with rhubarb, so I decided to use a premade strawberry rhubarb jam for the basis of this recipe and only add a minimal amount of the fresh (well, frozen) stuff in order to not make this soggy. I was crossing my fingers the entire time this was in the oven hoping that it was going to turn out and luckily, it did! Using a strawberry rhubarb jam makes this much sweeter than it would using fresh rhubarb which is pretty tart. I would love to make my own rhubarb jam with lesser sugar and then use that in this recipe to see how it turns out. 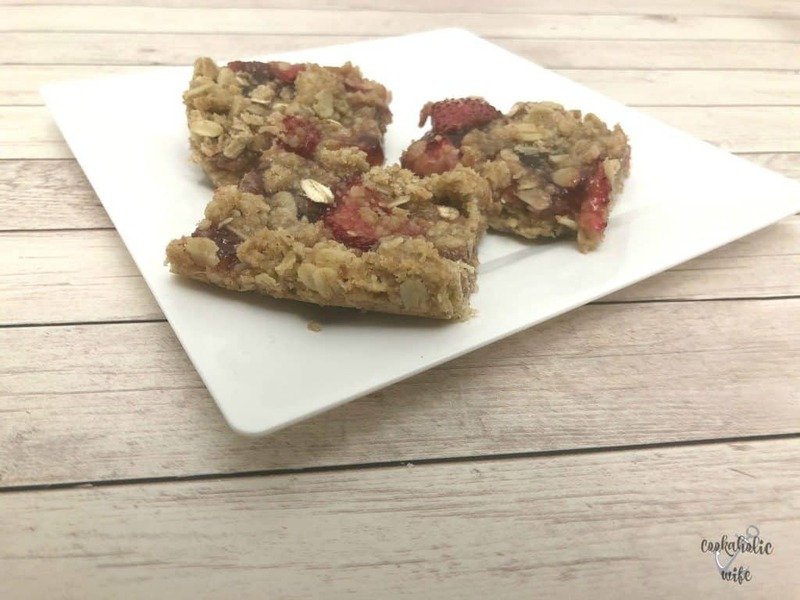 Crumbly and sweet, these bars are so good! The #ImprovCookingChallenge is a monthly blogging event where two ingredients are assigned to a month. Bloggers can make any recipe they like as long as it features the two ingredients. If you are a blogger and would like to join us, please visit our Facebook page. You can also read more about the event on our our home page. If you’d like to see previous creations, check out our Pinterest board.